Magician Douglas Cameron performs mesmerising close- up magic. Magician Douglas Cameron performs mesmerising close- up magic. One of Scotland’s most popular and clever magicians he performs with personality and charm. 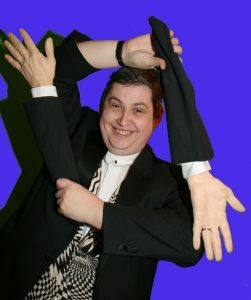 Douglas is highly experienced and a brilliant exponent of sleight of hand magic, mesmerising audiences with a superb range of magic delivered with a slick line of patter that leaves people spell bound. Douglas excels in close up magic and stand– up shows including international conferences, parties, weddings & product launches. He has a warm easy personality that always puts his audience at ease while he brilliantly entertains them. Douglas Cameron’s children’s show is highly interactive and lasts for 45 minutes. It is full to the brim (actually overflowing) with magic and tricks that children of all ages adore.